Tim has cerebral palsy and is not able to walk or stand without assistance. He needs extra support when sitting, but is able to move around his home in Worthing by crawling or sliding on the floor. Our team designed and made a chair for Tim with a seat at floor level so that he can get into it by himself. His upper body is kept upright by the chair’s arm and side supports. 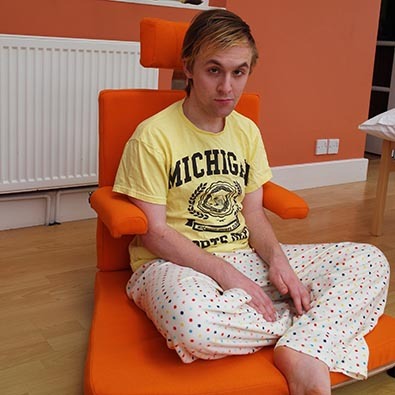 To help Tim’s mum the chair also folds, so she can easily carry it up and downstairs to allow him to use it anywhere in his home.